now March2010 added Torque, Inertia. Electric motors turn electricity into motion by exploiting electromagnetic induction. A current-carrying loop that is placed in a magnetic field experiences a turning effect.A simple direct current (DC) motor is illustrated here. ABCD is mounted on an axle PQ. The ends of the wire are connected to a split ring commutator at position X & Y. The commutator rotates with the loop. Two carbon brushes are made to press lightly against the commutators. The motor features a external magnet (called the stator because it’s fixed in place) and an turning coil of wire called an armature ( rotor or coil, because it rotates). The armature, carrying current provided by the battery, is an electromagnet, because a current-carrying wire generates a magnetic field; invisible magnetic field lines are circulating all around the wire of the armature. The key to producing motion is positioning the electromagnet within the magnetic field of the permanent magnet (its field runs from its north to south poles). The armature experiences a force described by the left hand rule. This interplay of magnetic fields and moving charged particles (the electrons in the current) results in the magnetic force (depicted by the green arrows) that makes the armature spin because of the torque. Use the slider current I to see what happens when the flow of current is reversed. 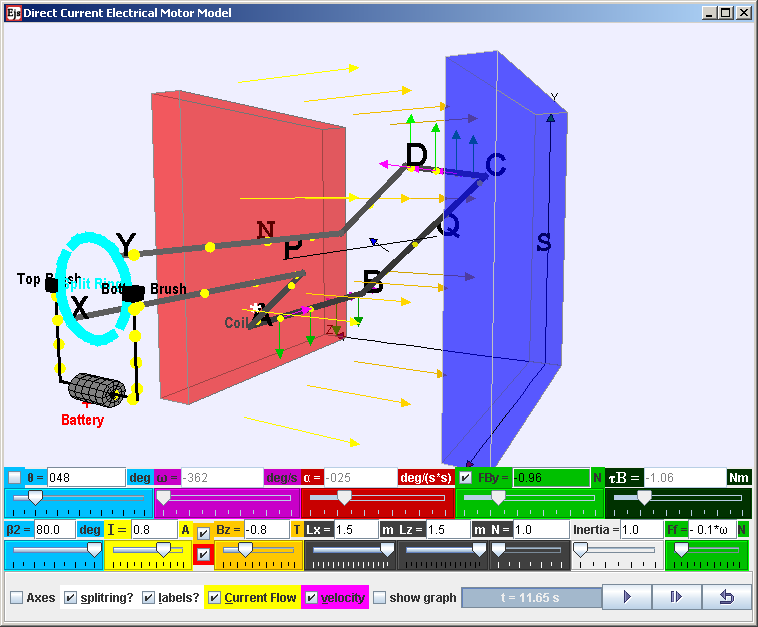 The checkbox current flow & electron flow alows different visualization since I = d(Q)/dt and Q= number of charge*e. The Play & Pause button allows freezing the 3D view for visualizing these forces, for checking for consistency with the left hand rule . The split-ring commutator allows electricity flows from the positive terminal of the battery through the circuit, passes through a copper brush [rectangle black boxes] to the commutator, then to the armature. Postive current runs through ABCD as shown in the diagram (select the checkbox labels? ), a +y direction force would act on AB. An -y direction force would act on CD. Taking moments about the axle conveniently, reveals a resultant torque T = Fmag*AD*cosθ acts on the coil loop. The coil loop rotates in an clockwise manner (view from battery side) starting 90o until it reaches the θ = 170o position (assuming that split ring angle are default at β2 = 80o). At this θ = 170+o position, the current is cut off. However, the momentum of the loop carries it past the horizontal position until the coil loop reaches θ = 190o position. Contact between loop and split ring commutator is established again and the current in the coil loop is now reversed (note that current i is still positive). A -y direction force now acts on AB while a +y direction force acts on CD. The rotation motion is reinforced clockwise (view from battery side) as θ continues to rotate from 190o to 350o. At this θ = 350+o position, the current is cut off. However, the momentum of the loop carries it past the verticall position until the coil loop reaches θ = 10o position. Contact between loop and split ring commutator is established again and the current in the coil loop is now reversed back to same as at θ = 90o. A a +y direction force would act on AB. An -y direction force would act on CD and the loop reaches θ = 90o . The cycle repeats after θ = 90o allowing the armature to experience torque in the reinforced direction at the right time to keep it spinning. The purpose of the commutator is to reverses the direction of the current in the loop ABCD for every half a cycle. A swing back and fro motion (maybe θ = 90o increase to 270o and decrease back to 90o) is all you would get out of this motor if it weren't for the split-ring commutator — the circular metal device split into parts (shown here in teal with a gap of β2) that connects the armature to the circuit. The external magnetic field Bz can be varied using the slider Bz. When Bz is positive, it is in the direction vertically up. Vary Bz until it is negative, what is the direction of the Bz then? The current comes from the battery higher potential end and travels in a wire forming a closed circuit and travels back to the lower potential end of the battery. When θ = 0o current flows from the battery higher potential end, to the top brush, to the RED split ring, through the coil loop in order ABCD, back to BLUE split ring, bottom brush and lower potential end of the battery. What is the direction of the current flow in wire AB? What is the direction of the current flow in wire CD? using Fleming's left-hand rule, deduce the relative directions of force acting on i) AB ii) CD iii) BC iv) DA. hint: note that Fmag = I*B*L*sin(I&B) may be useful. By taking moments about the axle PQ, consider the forces on AB and CD, deduce the direction of the torque and the motion if the coil loop was initially at rest (ω = 0 deg/s). Select the suitable sliders of your choice and verify your hypothesis for 2 angles. Discuss with your partner what you have discovered. Ask your teacher if there are any problem/issues faced using this virtual lab. Explain and show the equations involving T ( in earlier part of question), why the forces on wire BC and DA did not contribute to the calculation of rotating torque about axle PQ? By considering the forces in the x direction for wire BC and DA, suggest what can happen to the coil loop if the forces are large enough. Suggest why it does not happen in terms of the properties of the wires in the coil loop. After conducting some inquiry learning on the virtual DC motor model discuss how this turning effect is used in allowing the coil loop to rotate. 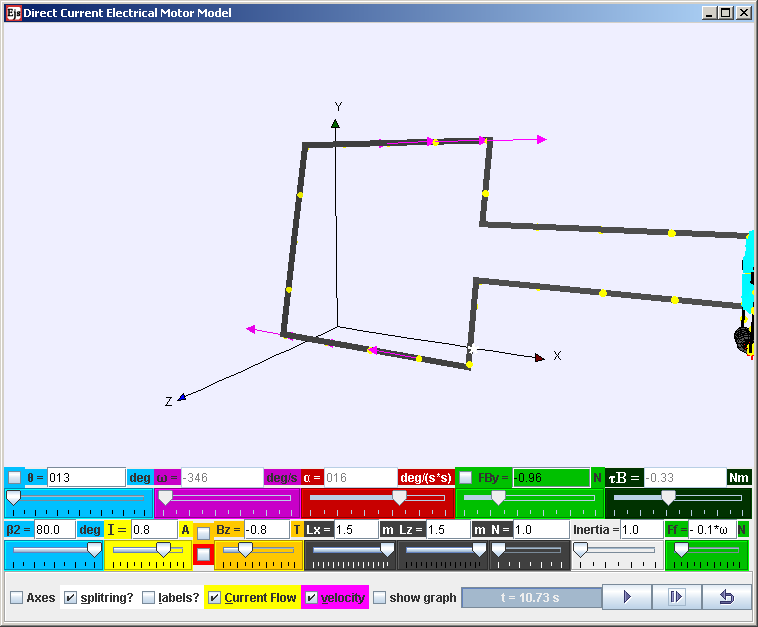 You may right-click within a plot, and select "Open EJS Model" from the pop-up menu to examine the model equations of the motion. You must, of course, have EJS installed on your computer. Describe the action of a split-ring commutator in a two-pole magnet setup, single-coil motor. Suggest the effect adding a soft-iron cylinder in the winding the coil. 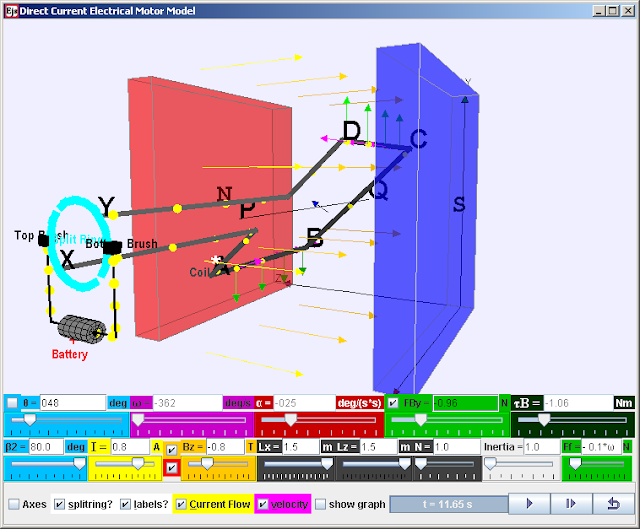 Please submit your remix model that model features that are not available in the existing virtual lab and share your model with the world through NTNUJAVA Virtual Physics Laboratory http://www.phy.ntnu.edu.tw/ntnujava/index.php?board=28.0. Impacting the world with your model today! 13 added particles for battery side wires which the particles motion is always from + potential so some code need to be re-purposed. 21 rectified a major design mistake which i created due to misinterpretation of the usage of variable "sign" and finally got it to work (move) in correct representation/convention even with electron particles by designing with my own logic of how it can be made to do the simulation according to my understanding of the physics involved. 20March 2010 thanks to Taha Mzoughi http://physci.kennesaw.edu/mzoughi/bio.shtm remixed model, i realized what enhancements can be done. new assumption in sim is inertia is not affect by N, each slider controller is for conceptual exploration, not exactly mimicking real equipment so to speak. fixed a bug with B and Bcorrect after a sharing that i realized the left hand rule should be correct now. in these few 6 days, i have spent many hours trying to understand how this applet is made. I have remixed and redesigned some parts to be a interactive tool that i can be true to myself when i say that this work will impact the classroom of schools positively as a virtual lab. 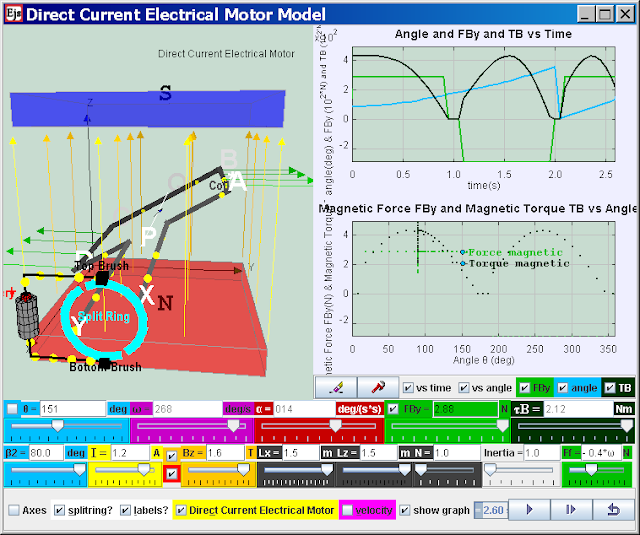 i suggest teachers to buy a real physical DC motor to teach and supplement it with the virtual lab as a safe and hassle free way of allowing learners centered activities. do post your experiences and ways to improve the virtual lab. once again, i would like to thank the Ejs community especially Fu-Kwun Hwang, Francisco Esquembre & Christian Wolfgang! The power to create is in our hands now. i think i need to redesign the behavior of the split ring to rotate instead of the original stationary design. Those videos are interesting. There is something on my mind that is really bothering me about this Electrical Motor Model. I do not have much knowledge about this. Can you please help me? They are used to introduce the power of learning from the simulation. Thanks. There is something on my mind that is really bothering me about this Electrical Motor Model. I do not have much knowledge about this. Can you please help me? what do you want to know? maybe you can read the text that introduce the simulation first and ask specific questions about it. I can only help if i know what you ask specifically. found this activity to be super cool. I can watch it again and again because despite the video being clear, i learn more things everytime i watch it again. Taha Mzoughi's implementation of the torque looks ok but i don't understand why his model the inertia of the DC motor affects the magnetic force. torque and inertia are desirable for future versions of the DC motor! This proto-type version with 3dJava is currently under development. A electric motor is a device for transforming electrical energy into mechanical energy; an electric generator does the reverse, using mechanical energy to generate electricity. At the heart of both motors and generators is a wire coil in a magnetic field. In fact, the same device can be used as a motor or a generator. When the device is used as a motor, a current is passed through the coil. The interaction of the magnetic field with the current causes the coil to spin. To use the device as a generator, the coil is spun, inducing a current in the coil. In North America, AC electricity from a wall socket has a frequency of 60 Hz. but in Singapore is 50 Hz The angular frequency of coils or magnets where the electricity is generated is therefore 60 Hz in USA or 50 Hz in Singapore. To generate DC electricity, use the same kind of split-ring commutator used in a DC motor to ensure the polarity of the voltage is always the same. In a very simple DC generator with a single rotating loop, the voltage level would constantly fluctuate. The voltage from many loops (out of synch with each other) is usually added together to obtain a relatively steady voltage. Rather than using a spinning coil in a constant magnetic field, another way to utilize electromagnetic induction is to keep the coil stationary and to spin permanent magnets (providing the magnetic field and flux) around the coil. A good example of this is the way power is generated, such as at a hydro-electric power plant. The energy of falling water is used to spin permanent magnets around a fixed loop, producing AC power. doing some literature review on "Electric Generator simulation physics" and found this. watch the output voltage in a voltmeter but it appears to be qualitative, lack mathematics representation? can this be a research gap to be argued for designing simulations on DC and Ac generators to address difficulties in learning electromagnetism for my study? 1 E&M has force and charge particles that are invisible (Chabay & Sherwood, 2006) hence cannot be readily related to daily life. 4 mechanical concepts forces, angular displacement, velocity acceleration, representation due to the interlink concepts to the broader realm of mechanics (Bonham, et al., 1999; Galili, 1995), gives initial difficulties. i am going to create different versions and upload there instead to prevent losing the work. i made a mistake in the codes and i cannot get the model to run correctly as it should be. the splitring is not working correctly with the electrons, current is correct. I am sorry that I do not fully understand what you mean. Could you show me with screen shot and indicate the problem? I also need the jar file. Because several files were missing when I load your xml file. Let me try to fix the bug. It is rather complex now and unreasonable to ask u to debug it. I have a splitring function now that is difficult to implement without understanding all the codes. I think I need to invent another way for the electrons to be control instead of using only sign as a means of changing the current n electron . I will try to add a new variable to the checkbox to control the electron sign. You can download any older jar it should have all the files there. Fixed! amazing i managed to fix bug cause i was so worried i couldn't find it and come up with a solution. indeed some rest and try again helps for this situation. when tired, just rest and let it incubate in my mind. creativity works with there is enough time, not pressure. this top post is the latest sim! below are the comments and my proposed solution to co-developed the lesson. Page2, last paragraph, line 2. I was initially confused by the y-direction force indicated. It's after tinkering that i realised your Z is vertical, y is horizontal. Could be a potential confusing point for my students. Page 4: In Qn4, the attached ss of the sliders is very dark, especially the 2nd and 3rd one. Guess the students can refer to the simulation for these. Page6: Qn11. Sorry, i dotn know the answer to this. Qn 10 seems to be wanting me to know the coil might be pulled apart if the forces are large enough. . . but why it doesnt, i dunno. Yes! the structural strength of the coil keep the shape intact. in addition, if students can explain why real Dc motor are with a iron core to strengthen the B field as well as provide the material of the coils to remain its shape. Page 7. Explore Activity B. Do they have to design experiments for all 3 parts? How much to design? Seems no need to write, but simply just rotate among the variables given as independent variables? How much time would that entail? Page 7 Qn 13. Would the students know which "inquiry learning" you are refering to? so long as it takes for student to explore meaningfully as productive activity, teacher need to support the weaker groups? Page 8. Qn 15: "....by varying..." this i changed on my system. Page 8. Extend problem. Graphs. There are redundant axis labels. Eg the first pair only refers to FBy rather than the indicated angle and TB. Can these be removed? On my system, i just cover the redundant ones with a rectangle. Page 9. Graphs, same problem as Page 8 graphs. Same solution. Page 10. Qn25. the angle cta . . . can change to some other symbol thats more angle-like? theta or alpha or something? I dunno the reason for the choice of "cta". lastly, just a general comment that this worksheet requires more brains and thinking than i initially expected. Its probably because I'm too lazy to think through the entire worksheet properly, but just scanning through. Some answers are not immediately obvious to me. the intend is to allow a deeper exploration possible through the data analysis and perhaps even some simple mathematical model equation to curve fit the data. exactly what to do, i have not figure out yet. 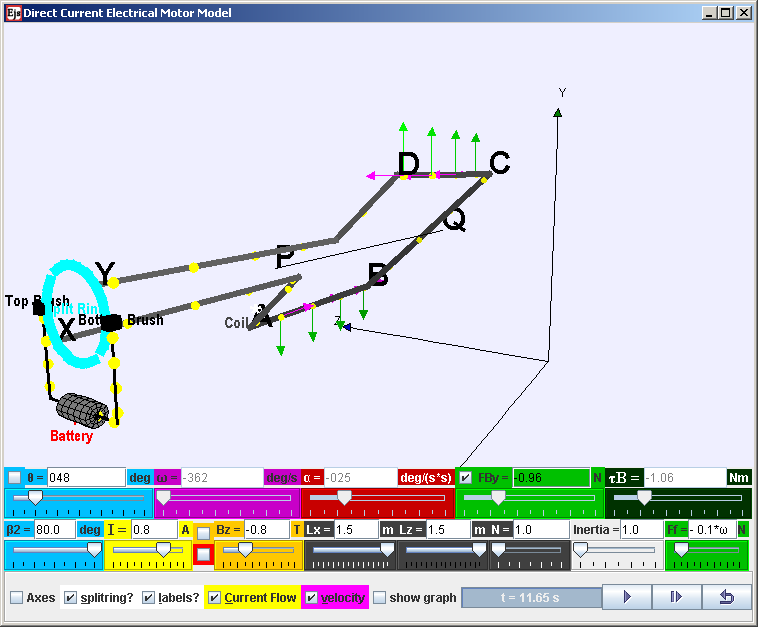 the feature was ported from the AC generator as there is a sine and cosine curve for the emf and current. Dc motor i need to think what to do in order to deepen the appreciation of the physics through mathematical analysis of the data. I like the modified version later have free time im gonna publish on egtecno.com. Good job what you done. same problem in the iMac. it works well in windows. I've problems trying to download the jar file from the link stated in the threads. is it possible for you to upload the jar version of the applet? It's really useful for the kids to understand the concept of DC motor. The file is actually a jar file. SSOE machine on Internet explorer ? U need to use Firefox to download the file correctly as SSOE Internet explorer some how associate the file as a zip extension instead of a jar extension. Could u try to download at home using your own PC ? yah, i'm actually "stuck" in a local sec sch trying to push IT initiatives for physics within my dept. Haizz, it's really a tough job to plough the whole internet finding resources and programs created by others, in a way, praying that someone has really come up with suitable programs and uploads them on the internet. Speaking of the file extension, u gave me the idea to add ".jar" to the document name before saving it and it works. Thanks for your efforts in pushing great reforms to our sch system as I feel it's still lacking on the IT fronts. received an email and Facebook request for the following features! actually it is all possible already hahaha. This is the most fantastic simulation for DC motor, thanks to Professor Fu-Kwun Hwang! Hi Loo Kang, I'm using your motor applet (http://weelookang.blogspot.sg/2010/06/ejs-open-source-direct-current.html) and really like your applet. Is it possible to make the following changes when you are free to better serve my teaching needs. Thanks. 1) Adding arrows to show current direction instead of electrons motions which are too fast and too small to see. 3) Adding a button to prevent angular acceleration (i.e. rotate at constant speed). The motor spins too fast after a while and is very hard to analyze. Alternative add in back emf so that it is more realistic and hence will have a maximum angular velocity. 1. click on the check-box velocity. 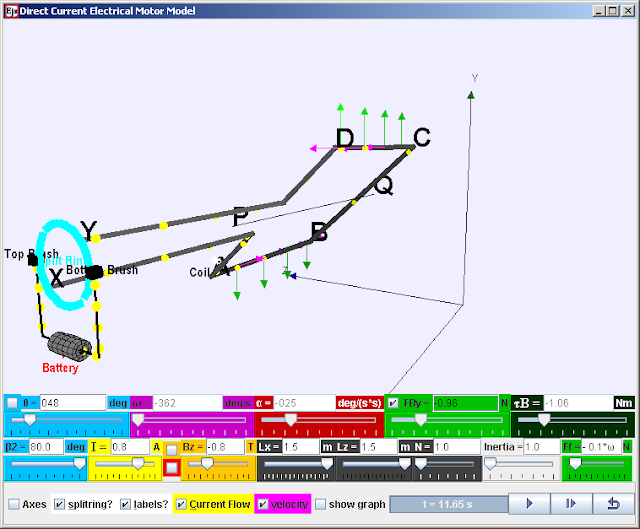 request 1.Adding arrows to show current direction instead of electrons motions which are too fast and too small to see. already available, select FBy checkbox! request 3) Adding a button to prevent angular acceleration (i.e. rotate at constant speed). The motor spins too fast after a while and is very hard to analyze. Alternative add in back emf so that it is more realistic and hence will have a maximum angular velocity.